I myself have the slight slippage issue that this particular model is known to have and has been discussed about. I was hoping to do this myself, but I am not sure how to disassemble the cranks. I tried placing a appropriate sized hex into it attempts to loosen it with no luck so I was hoping someone could share with me the proper process and tools I may need to do this correctly. I tried seeing in anyone had posted a guide to doing this via forum searches and youtube videos but I was not able to come up with anything. If someone could perhaps tell me the step by step method to disassemble it so I can do the JB weld fix I would greatly appreciate it. I was also wondering if it was a possible solution to just replace the Carbon Disc (which many have discussed is the cause of the slippage issue due to poor design) with new arms? And here's the bike I am riding! You need a chainring bolt spanner. See the notch on the back side of the chainring bolt? This tool fits on the back of the nut to provide leverage when tightening the bolts. Also, apply a little loc-tite to the bolt threads and torque them properly to prevent them from working loose. Try that before potentially destroying your crankset and chainring. Do you have the crank off the bike already? ^ No I do not have it off the bike yet. I need to purchase the above tools that striknein posted tomorrow which I assume the LBS will have. Will it be ok to attempt to the JB weld process with the cranks on the bike still or should I remove the whole crankset while I attempt this? I have never removed a crankset before either, but it seems like a pretty straightforward process (With the right tools). Do I need any special tools to do this? You need a crank puller. Google that, you'll figure it out. Make sure the puller is Isis comPatible bc I think your crank is Isis not square taper like the replacement you pictured. Its also not 100% that you need the crank bolt tool. Some bolts are hex on both sides. I cannot tell u if you can attach the carbon piece to the crank without removing the works from the bike. I've never seen the crank. Regardless, even if you can, you shouldn't. 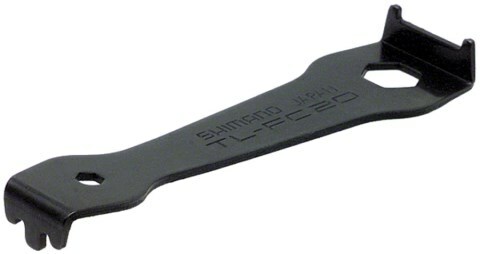 If you decide to buy a spanner for the chainring nuts the Shimano TL-FC21 (or TL-FC20 pictured above) is the one to get. The others I have tried were from cheesy metal, do not fit the nuts as well and are liable to strip them especially at removal time.